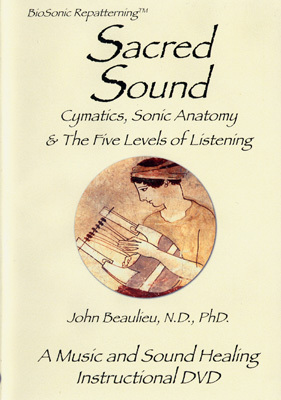 Through this visual experience of how sound affects your physical body you'll acquire a foundational understanding of how sound healing really works. This DVD will make you better equipped to use your BioSonic tuning forks or listen to sound healing CDs. Part I: Cymatics - the study of sound as pulse, wave, and form. Part II: Sonic Anatomy - demonstrates the relationship of sound to cranial and spinal motions for healing. Part III: The Five Levels of Listening - sets forth a system for understanding.